XING-SA is a trio (keyboards, bass, drums), all 3 musicians from SETNA (whom still exists & are now recording their next CD). 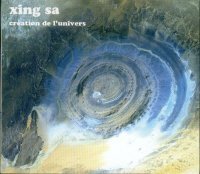 Xing-Sa is a side band led by Keyboardist Nicolas Goulay ; while Setna is led by drummer Nicolas Cande. The music is Zeuhl/prog, almost completely instrumental, with long tracks. The compositions are rockier than in Setna & the Cd features, as guest, Yannick Duchene Sauvage from band NEOM. Powerful & spiritual this recording will delight both Zeuhl & prog fans, with notably superb moog works ala Benoit Widemann. A future classic of the genre. Xing Sa has made a concept album quite like any other. As the title implies this is nothing less than a sonic imagining of the “Creation”, and as such it truly casts a powerful musical spell. The band (a trio) use keyboards, bass, drums that are enhanced by three guest musicians on voice, Chau gongs and atmospheric saxophone. Each of the 6 pieces are subdivided into unique thematic segments all of which combine into one powerful conceptual whole. At times atmospheric and cerebral, then alternatively powerfully intense, CREATION DE L’UNIVERS is quite anything I’ve heard before & makes for fascinating listening.